G and I decided that it was time to actually use "the gold book" - aka the Entertainment Book. We tore out 3 or 4 vouchers redeemable on Fitzroy St, St Kilda, and jumped on the number 16 tram. We ended up eating dinner at The Elbow Room with a complimentary main meal voucher. 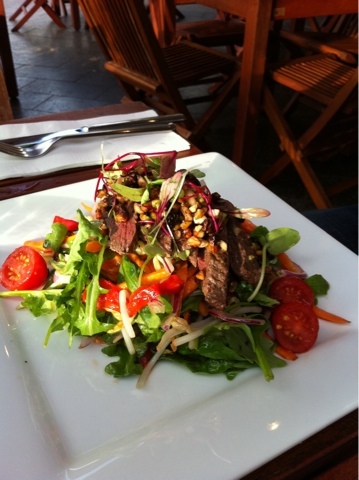 G had the kangaroo steak salad, described as "medallions of pistachio crusted kangaroo fillet on a garden salad and sesame dressing" and I had the duck risotto + drinks = $45 (or $70 without the voucher). G's kangaroo was a little lacking - certainly very small medallions, which led us to make jokes that perhaps the fillet had come from a rock wallaby, rather than a 'roo. 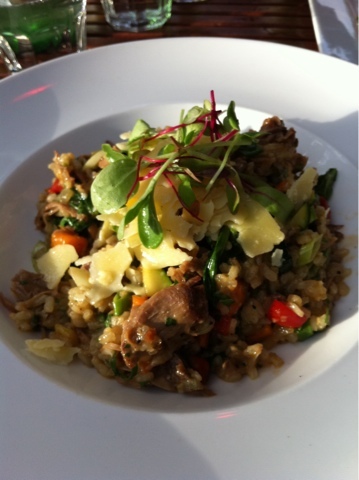 My risotto was deliciously ducky, big pieces of tender duck and the risotto tasted like it was cooked in a duck/gamey stock - lovely and rich. 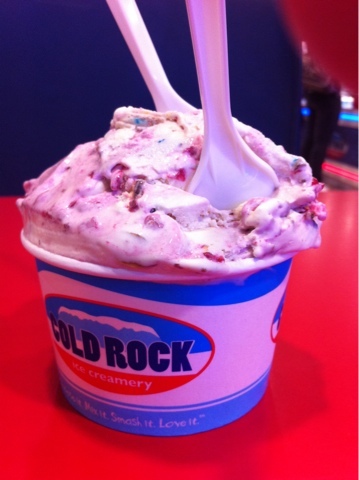 Being super glamorous, we finished up at Cold Rock - peanut butter ice cream with tim tams, raspberries and pb m&m's mixed in.